Earn 700 Cute Points upon purchasing this product. Add a peculiar funky addition to your bangle collection, “Frill Me Up” bangle will add a girly touch to your wardrobe 🙂 A hard to miss design from my original Frilled collection. It’s a unique and stylish design for everyday wear. FIT: Will fit up to a 6″ wrist comfortably. Each one is unique due to its handmade nature. 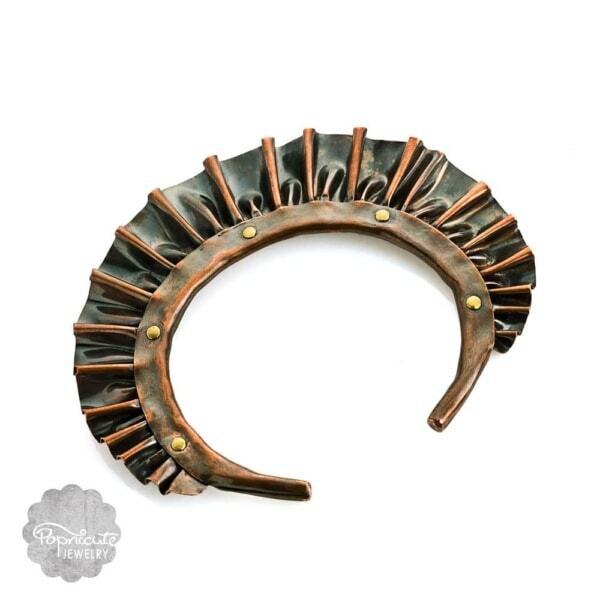 “Frill Me Up” is a unique copper ruffle bangle that has a pretty simple design but crammed with details. 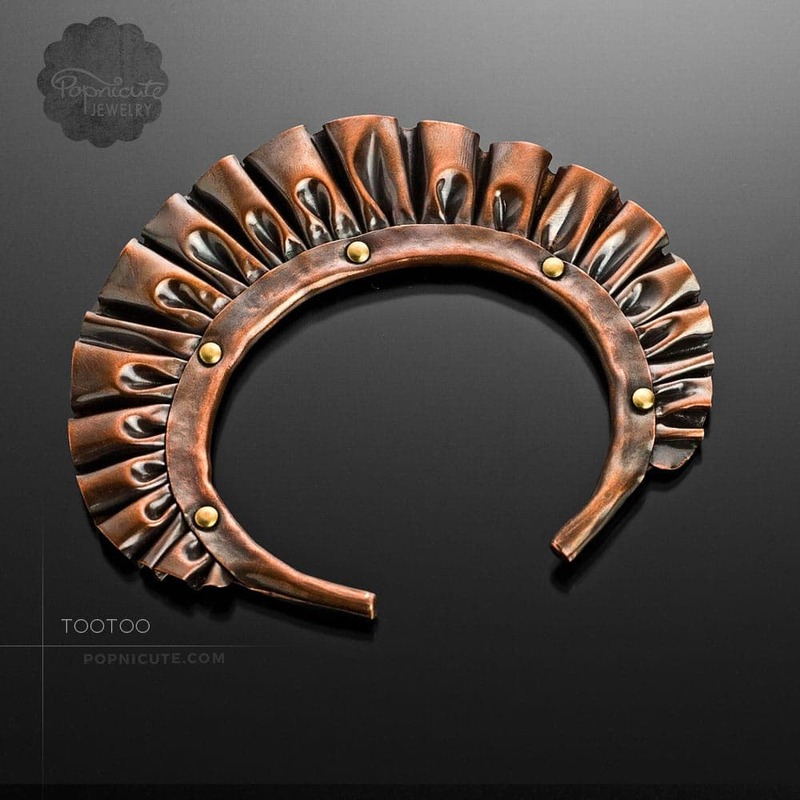 It features ruffled copper sheet with riveted rounded bangle. 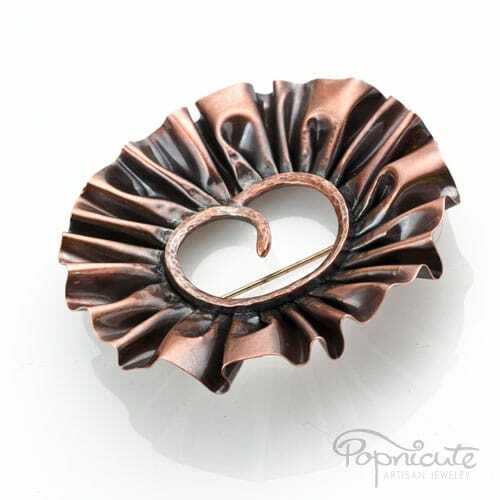 It’s a delightful copper jewelry design to add to your collection. I handcrafted these ruffles from a thin copper sheet that I gathered like a fabric ribbon. 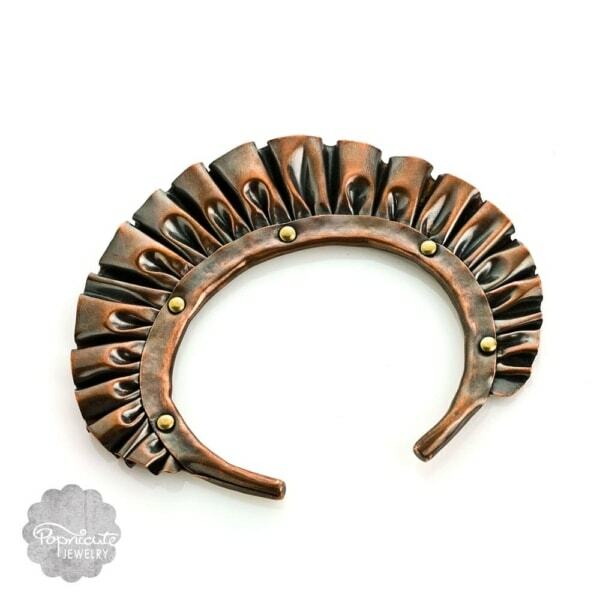 Because the copper sheet is less pliable than fabric, multiple firing, folding, forming, and hammering was done to accomplish the dramatic shape.Bangle bracelets can be used to accessorize almost any outfit. Available in a stunning variety of colors and styles, in this case, copper with a touch of brass rivets, bangles are the perfect choice for the busy woman who wants to look great but doesn’t have a lot of time to spend accessorizing. Just slip it on your wrist and you’re done. Bangle bracelets can be used to accessorize almost any outfit. Available in a stunning variety of colors and styles, in this case, copper with a touch of brass rivets, bangles are the perfect choice for the busy woman who wants to look great but doesn’t have a lot of time to spend accessorizing. Just slip it on your wrist and you’re done. Read these tips on how to wear bangle bracelets. These copper ruffles are tough but I wouldn’t recommend dropping it on hard or sharp surfaces as it may dent the ruffles. In conclusion, Handle with care. Are you fancy enough to wear this unique copper ruffle bangle? It’s a crowd stopping design. Guaranteed you won’t find this design anywhere else. It’s uniquely mine. A great accessory for the warmer weather where you can show off your arms and wrists. It’s fun to wear and shows a lot of personalities. Wear it alone or stacked with other bracelets in your collection it’s completely up to you. Be creative and bold! An original design and signed by Popnicute. The copper color is neutral. Copper will complement any color in your wardrobe especially if you’re keen on earthy colors. Though surprisingly, copper also looks good against hot pink and it pairs well with silver jewelry! Learn more about copper in the Metal Facts page.